Abu Dhabi, October 13, 2018: startAD, the accelerator and entrepreneurship hub anchored at NYU Abu Dhabi and powered by Tamkeen, announced Synx, Pand.ai, and AIMLedge as the winning startups of its inaugural Artificial Intelligence (AI) Venture Launchpad. 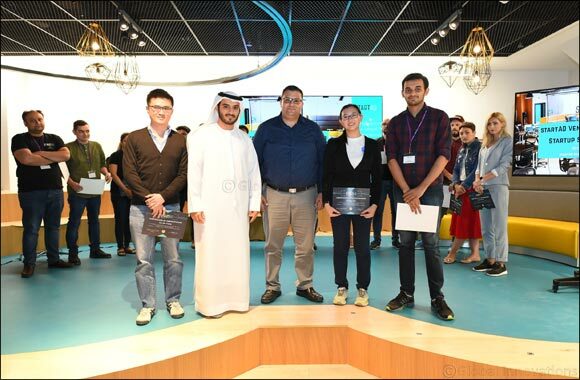 Synx, which uses a service that automates time-consuming machine learning processes, allowing data scientists and engineers to train, deploy, and run models at scale, was selected by both Etihad Aviation Group and UAE Exchange as the winning team. With its pitch, Synx received the Etihad Innovation Kickstarter Award, which will enable the startup to launch a paid proof of concept at the Etihad Innovate Lab. The Synx team will then present their solution to the Etihad Innovation Committee. Synx also won the UAE Exchange Innovation Award, which includes a cash prize of $10,000. Meanwhile, ADNOC Distribution has backed both Pand.ai and AIMLedge to work on proof of concepts. Pand.ai builds intelligent chatbots to help companies improve conversion rates of site visitors into customers. Serving a range of sectors, including finance and insurance, Panda.ai are able to realize a tenfold increase in conversions. AIMLedge, which was established earlier this year in Singapore, works to enable customers to easily develop and deploy customized deep learning solutions. The team specializes in analytics applications for edge devices, and can reduce development times by 80%. Held in partnership with Etihad Aviation Group, UAE Exchange, and ADNOC Distribution, the AI Venture Launchpad is a 10-day sprint accelerator that provides startups operating across a range of industries with the skills necessary to develop a scalable, repeatable, and commercially viable venture. Other participating startups will also have the opportunity to work on proof of concepts with startAD’s partners. The AI startups concentrate on disruptive technologies across a range of key sectors, including finance, insurance, regulation, airport operations, predictive maintenance, fuel efficiency, and data analytics. More than 200 startups from around the world applied for startAD’s AI Venture Launchpad, 10 of which were shortlisted and completed the 10-day training session. Since 2016, 80 startups from 15 countries have graduated from startAD’s Venture Launchpad program, raising more than $4 million in investments and grants.